Audible can't be played on this iPod? When you try to put Audible books to your iPod modes, like iPod Nano, Shuffle, Touch, etc. have you met the same situation that you can transfer Audible books to iPod but can't play them and receive an error message saying 'the files can't be recognized'? If yes, please don't worry. You can read on this article and then you will know the true reasons why Audible books can't be playable on iPod and get the professional tutorial on how to put Audible books on iPod for playback. It's well known that Apple allows Audible users to listen to audiobooks on computer directly and transfer them to iPod devices for playback with the help of iTunes. But before downloading audio books from Audible for syncing to iPod, it's important to be noted that most iPod models can support for different audio formats with the limitation of an audio file size. Let's check the compatible audio formats out according to different iPod model and generation. In general, iPod Nano can work well with Audible format 2, 3, and 4, while the iPod Shuffle is compatible with the Audible format 2 and 3. Besides audio formats, the premise is that the audile file size allows. As consequence, you'd better to download or cut audiobooks, which are longer than 20+ hours in smaller segments by splitting Audible books by chapters before loading them to iPod Nano and Shuffle. If you are using an iPod Touch, congratulations, you don't need to worry about restrictions what we mentioned above. There is an Audible for iOS app coming to iPod Touch by default. That's to say, iPod Touch works well with any kind of Audible formats, including AA and AAX audio files. 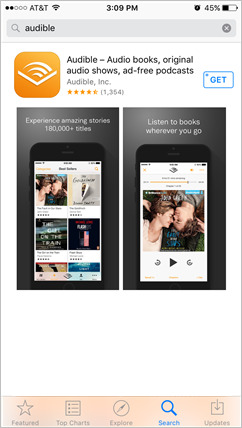 As Audible app is available for iOS devices officially, like iPod Touch, iPhone and iPad, there is an official way to get Audible books available on Nano mode. With the purpose to integrate iPod Touch and Audible, please navigate to Apple App Store and download Audible Manager app to your iPod Touch. After that, you can refer to the following step-by-step tutorial to play Audible AA/AAX files on iPod Touch. Step 1. Open Audible app and login your Amazon account details, like name and password. Step 2. Navigate to the 'Library' option and access to whole audiobook library. You can start to click the item that you'd like to play. Step 3. If you'd like to listen to Audible AA/AAX files offline, please click the 'Download' button to download books in advance. Since there is no official app for Audible on other iPod modes, you need to get help from iTunes software for transferring audiobooks to iPod Nano and Shuffle. Before get started to follow the below guide, please make sure you have downloaded right book format with right file size for Nano and Shuffle. And as for Windows users, you need to create a new Audible playlist and sync Audible files to iTunes. Step 1. Connect iPod Nano or Shuffle device into your computer via USB cable and launch iTunes on your computer. Step 2. And then you will see iPod mode will show up in the left-side menu of iTunes, please click the 'File' > 'Devices' icon to select your iPod. Step 3. Please hit on the 'Audiobooks' tab from the left-side menu bar and select 'Sync Audiobooks' > 'Selected Audiobooks' button to locate Audible files you'd like to transfer. Now, you will be able to listen to Audible books on popular iPod generations. But they, except iPod Touch come with a lot of limitations to prevent from syncing audiobooks. You can't take control of how long audiobooks are and what format they are encoded. What's more, how about you are possessing an older iPod device, like iPod Classic? 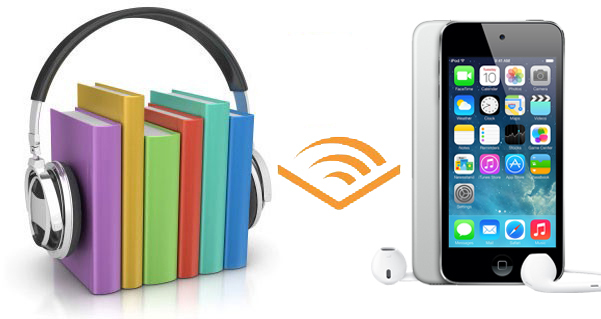 To unlock all limits, here, we will introduce another professional and effective way to help you play Audible AA/AAX books on all iPod devices without problem. It is to use an audio converter for Audible, called AudFree Audible Book Converter to convert protected AA/AAX files to any iPod supported audio files, like MP3 while splitting Audible books by chapters for getting smaller segments. Step 1. Please click the first 'Add Files' button at the bottom-left corner to select audio files from iTunes library and add them to AudFree software. Alternatively, you can drag and drop them to the main conversion window directly. Step 2. Now, you can start to click the 'audio' format icon to open setting window, in which you can define output format as iPod compatible files, like MP3 and split audio files by chapters or times according to your needs. Step 3. When all settings are done, you just need to simply press the 'Convert' button to extract MP3 audiobooks from Audible AA/AAX files. 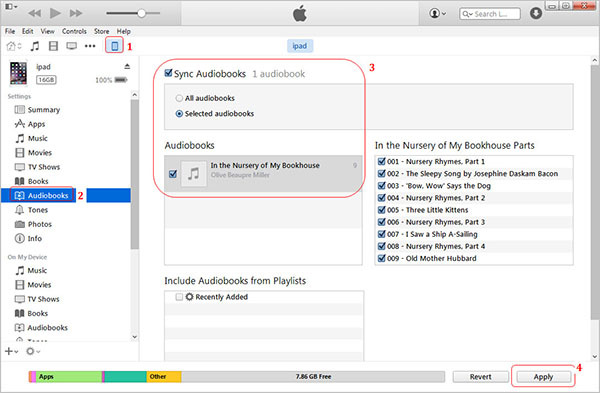 Once all added audio books are converted completely, you can click the 'file' button to locate them in destination folder on your computer and put converted Audible books on all iPod modes, like iPod Touch, Nano, Shuffle as well as Classic just like syncing common MP3 files to iPod for playback.